Had another profession of faith and then afterward we had 13 baptisms! The challenge as a portable church is how to do things like communion and baptism in an environment that’s not really conducive for things like that. For baptism it meant setting up a swimming pool out back. Chad, his boys and Andre set it up last night at 10:30pm and began the long process of filling it up. We were concerned whether the pool was going to collapse but it held up fine. As for the day itself set-up went well, nothing out of the ordinary. During run-through time I gave everyone instructions on how , who and when we’d start tearing down so we could get out to the baptism and have the theater ready for movies to begin. Glad we did that because when it came time later in the morning, everything ran like clockwork. For some reason energy was down today in the Experience but the band as usual did a great job leading. Today was the last in the Jonah series…you can listen to what I consider the shocking conclusion here. Amazing how we so often want forgiveness for ourselves but judgment for others. The plan was for the band to come forward during the prayer time and get ready to start tearing down once I started doing announcements. I’m trying to lead a very Holy moment and dodging people left and right who are literally taking the floor out right from under me. Still God is amazing and despite everything, we still had a young lady come into a relationship with Jesus! By the time I was done with announcements, the only thing left to tear down was sound and projection…amazing how quickly they did everything. I dismissed everyone to exit out the back door and I ran off to get changed and put the closing touches on things I needed to do before exiting the theater. Here’s a link to photos from the baptism. Huge thanks to my brother-in-law Brian for traveling in from out of town to take these…also to my nephew Jordan for shooting some video…can’t wait to see what he puts together. Check other people’s walls on Facebook for more photos…I’ve seen them starting to be posted. Got to admit I got choked up a number of times during the baptisms…one of my favorite things to do in ministry. What an honor to be a part of such a special moment in each of these people’s lives. Special mention for Dylan Krull…I remember him being born and dedicated and so many other milestones in his young life…now to get to baptize him is so awesome. Big thanks to Bill & Meghan Butler for building changing rooms in the trailer so people didn’t have to go home wet. Although I was amazed how warm the water was so I didn’t mind staying wet. As the guys started collapsing the pool they let too much go at first and it ran down the sidewalk and right into another theater!!! Luckily nothing was going on in that one yet and we were able to go in and clean it up…oops. Other than that it was a tremendously successful day. Best part was I ended up leaving the theater basically at the same time I normally do! Next week we begin the “God at the Box Office” series by looking at the spiritual lessons from the newest Transformers movie. Please share our commercial for the series with as many people as possible and keep handing out the tickets. The commercial can be found here on YouTube or here on Facebook. Can’t wait…I love doing series like these! Again heard through texts and seeing people in person at lunch that you guys had a good day today. 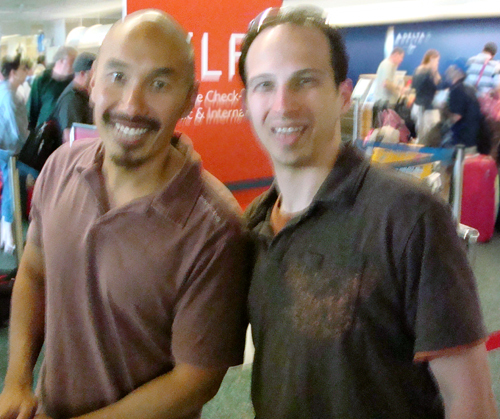 Hope you got a lot out of Francis Chan’s messgae…love that guy. When I was in Orlando a few months back I got to meet him. (pictured above). The best part of that day though was the hilarious intro he got. As for us…today we visited King Street Church, right here in Chambersburg. King Street is the area’s largest church but until today I had not had the opportunity to visit them. Unfortuantely I didn’t read their web-site well enough and we ended up at their blended service instead of the contemporary one. However, that was by far the best blended service I’ve ever seen. Their 50+ member choir rocked it out. I guess the thing I liked best about them wasn’t neccisarily their song selection or singing ability but the “attitude” in which they sang. They were having fun and you could tell they really believed what they were singing. They had a guest speaker so I wasn’t able to gauge that aspect of their services, although the guest speaker gave a good message on compassion. One funny thing happened…the lady sitting next to me stole mu bulletin. Don’t think she did it intentionally but I was partially sitting on it so you’d have thought she’d have at least asked. One other cool thing was seeing that Ryan Payne was playing acoustic guitar, in the background, for King Street’s worship team. Ryan’s band is really growing and has quite a following and I expect one day they will be signed by a major Christian label. Neat to see hi humble himself to serve. Reminds me of what Brian Houston, pastor of Hillsong Church, said about Darlene Zschech when she was becoming famous…”She has never forgotten that she’s to still serve in her home church”. After the service was over I got to meet the Senior Pastor, John Beukema. Seems like a nice guy and I’m proud that we get to partner with King Street and so many other great churches in our area to reach people for Christ. I’ve said it before an I’ll say it again…It’s not about United or CFCOG, it’s about Jesus and the Church which He died for. I’m glad we have other great churches in our area…we’re not in competition, but partners together. We meet with Lisa’s sister and her family for lunch at Red Robin. The 4 of them plus Lisa and I all share birthday’s within about a 40 day period…4 of us within 11 days…so this turned out to be our birthday meal. Funny thing was Lisa and Gayle were texting each other while we were there. I look up and over in the corner were the whole Krull family having lunch. In other words Lisa and Gayle were in the same restaurant texting each other and didn’t even know it. Of course we had some fun sending her texts about things she was doing and wearing…finally she caught on and realized we were there. Time for a nap and then our normal Sunday night crew will be getting together. Vacation is almost done…enjoyed it and for the most part I’m refreshed…can’t wait to see everyone next week!